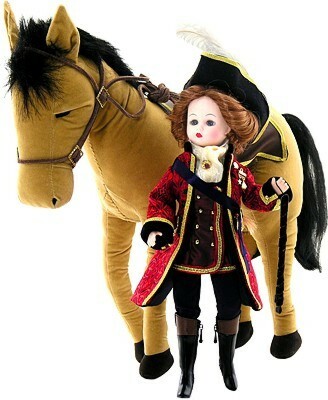 10" Catherine The Great was a terrific horsewoman and articulated Cissette with blue eyes and tawny colored hair which has been pulled up at the sides and braided long down her back, is ready to mount her royal horse and take off at full gallop with riding crop in hand. She's dressed in a military style outfit that features an ivory blouse, fitted twill pants, a double-breasted taffeta vest and a red brocade military jacket. Her vest of red and green iridescent taffeta is resplendent with gold, nail head, buttons and trim. The jacket is also trimmed with gold and features a black flocked collar and cuffs. A gold ascot with a gold emblem at her neck, military medals and a navy sash on the jacket plus black equestrian style boots all help establish the tone of her style. Her gold trimmed, black tricorn hat sits easily upon her head. Includes illustration card and cloth envelope.